So, just how did Hannah Brown and the Brown family fare in the months and years after the fire? Initially, the family likely escaped by going east to the shore of Lake Michigan to wait out the fire as did many other residents of the South Division.7 Some of the family may have left Chicago in the days following the fire. The David Brown letter states that, “After the fire . . . she [Hannah] lived with her son, Patrick and his wife and family on a farm at Saybrook, Illinois, until her death.”8 However, while on a research trip to Dublin a few years ago, I talked to one of the professional genealogists at the National Library. She stated that the Irish custom was for a widowed woman to live with a daughter as long as one was alive. So, did Hannah stay in Chicago or go to Saybrook? The family could have stayed with friends in the South Division. Beyond the business district and the surrounding residential area, the South Division was largely untouched by the fire. Likewise, most of the West District was unaffected. Many Irish lived in these areas including people with surnames like Brown, Kelly, Hogan, Moloney, Walsh, and Toomey (spelled Twomey in the directory) that are also found in the area of Fanningstown in County Limerick. There are other clues in City Directories after 1871 and the list of “Burial Permits”9 for Chicago. 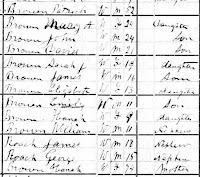 Johanna Brown Roach, youngest daughter of Hannah and wife of Thomas, is shown in the “burial permits” index for 1872. Her address is given as 361 S. Jefferson which is on the west side of the street at the intersection of Ewing. This building was not burned. (See location “A” on the map.) Ellen Brown died in 1874 and is shown at 79 Ewing, within the burn zone.12 (See location “B” on the map.) Ellen is living at the same address as Michael at the time of her death, but was living at the corner of Jackson and Franklin in 1871 along with the rest of the Brown family at the time of the fire. 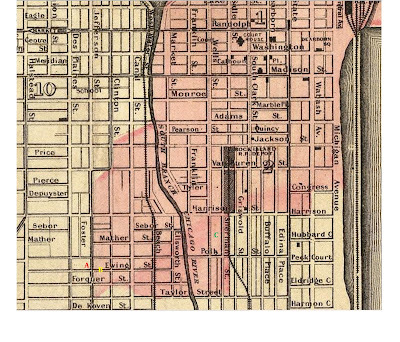 Location “C” is the Sherman Street address where James and Thomas were living until 1874. Patrick’s wife, Anne, died in 1878. (More about Patrick in future posts.) Although there is no evidence, I agree with the David Brown letter in that, “. . . It seems that after the death of his wife, Patrick Brown, carried on with the help of his Mother [Hannah] until she too, was taken about the year 1884 or 1885. After her death the home was broken up . . .”15 Patrick did break up his home about that time; however, there is one additional listing of Hannah in the Chicago City Directory. 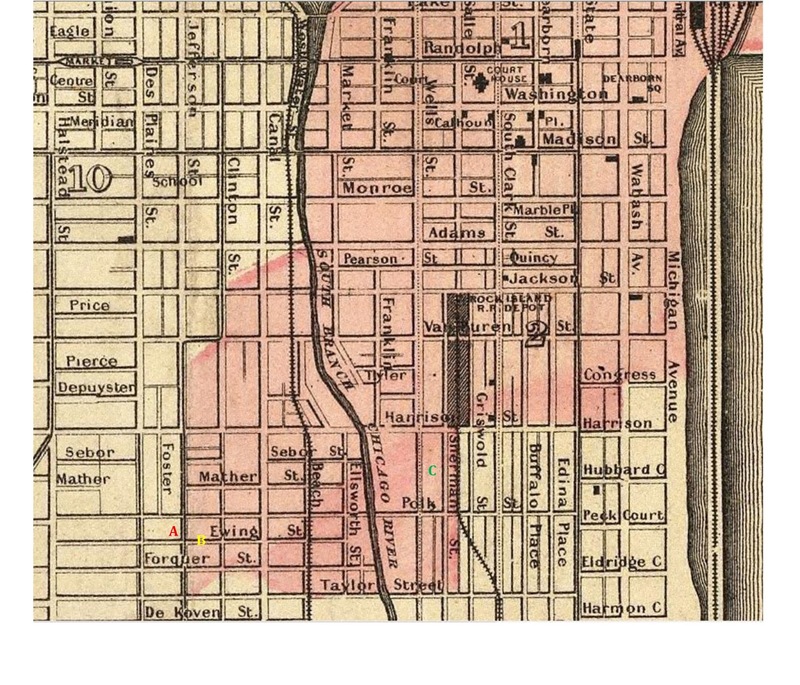 In 1885 Hannah is living at 175 S. Jefferson, (the corner of Jefferson and Jackson), with her oldest daughter, Mary Gray and Mary’s son Lyman.16 Mary Gray and her son are also listed in the 1886 city directory. Mary Gray died in Chicago in 1886; Lyman died in 1889. Both are buried in Mt. Olivet Cemetery in Chicago. nor, do I know her place of death. The David Brown letter states that she, “. . . is buried in St. Mary’s cemetery in Bloomington, Illinois.” (See image of page 3 of the David Brown letter above left.) Several years ago, I checked with the county offices in McLean County, Illinois and there was no record of Hannah’s death. I have also checked with St. Mary’s cemetery and have not found her there.17 It could be that Hannah died in Chicago and was taken to Bloomington for burial. Hannah could also have moved from Chicago to Bloomington after the death of her daughter, Mary. Several children of Patrick, grandchildren of Hannah, were still living in the area at the time and she may have lived with them. Since David Brown obtained his information from grandchildren who would have known Hannah, and definitely, in some instances, lived with her, it seems likely they would have remembered some of the details of her life and death. Because of this, I also believe Hannah’s final resting place is St. Mary’s Cemetery in Bloomington, with her son, Patrick, and Patrick’s wife, Anne. I will continue to search for more specific information, and, will post it if anything is found. However, I think it is now time to move on to other members of this immigrant family. We will next look at Patrick, the oldest son of Hannah Kelly and Timothy Brown, who also arrived in Boston in January 1849. Image - Sweeney, Thomas S., Ruins of the South Division, Harper’s Weekly, Harper & Bros., New York, N.Y., November 4, 1871, p. 1033. Originals accessed July 23, 2016, Cincinnati Public Library, Cincinnati, Ohio. The image shows the South Division looking north from Wabash and Congress, the very south east edge of the burned area. The Brown residence, at Jackson and Franklin, would be in the fuzzy area directly behind the First Presbyterian Church in the foreground. 3. Davis, R.R., The West Side Rink, Harper’s Weekly, Harper & Bros.. New York, N.Y., November 11, 1871, p. 1052, original accessed July 23, 2016, Cincinnati Public Library, Cincinnati, Ohio. Image – David, Theodore R., Improvised Shanties on the North Side, Harper’s Weekly, Harper & Bros., New York, N.Y., November 4, 1871, original accessed July 23, 2016, Cincinnati Public Library, Cincinnati, Ohio. 8. Brown, David Earl, Kewanee, IL, 11 May 1943, Letter to Esther ______, Columbus, OH, p.3. The letter written in 1943 contains detailed information about the Brown family as known by the author at that time. Saybrook, Illinois is located just a few miles east of Bloomington. Bloomington supplied Chicago with firefighting equipment and provisions even before the fire was extinguished. Rail transportation between the two cities was well established. 9. Indexes to deaths in the city of Chicago during the years 1871-1933: showing name, address and date of death. Commonly called “Burial Permits” since the indexes also identify people from outside the Chicago area. The indexes are available on microfilm at Family Search. I used film numbers 1295944 (Deaths, Bou-Cul 1871-1933), 1295946 (Deaths, Gol-Haw3 1871-1933), and 1295973 (Deaths, Rep-Sik 1871-1933) to research family deaths in Chicago. 10. Recall that Michael Brown was living at 219 Jackson Street in 1871. This is the same address for Hannah Brown and her family. Also, recall that Ellen Brown, widow of John Brown, was also living at this address suggesting that Ellen was married to the brother of our Timothy Brown. 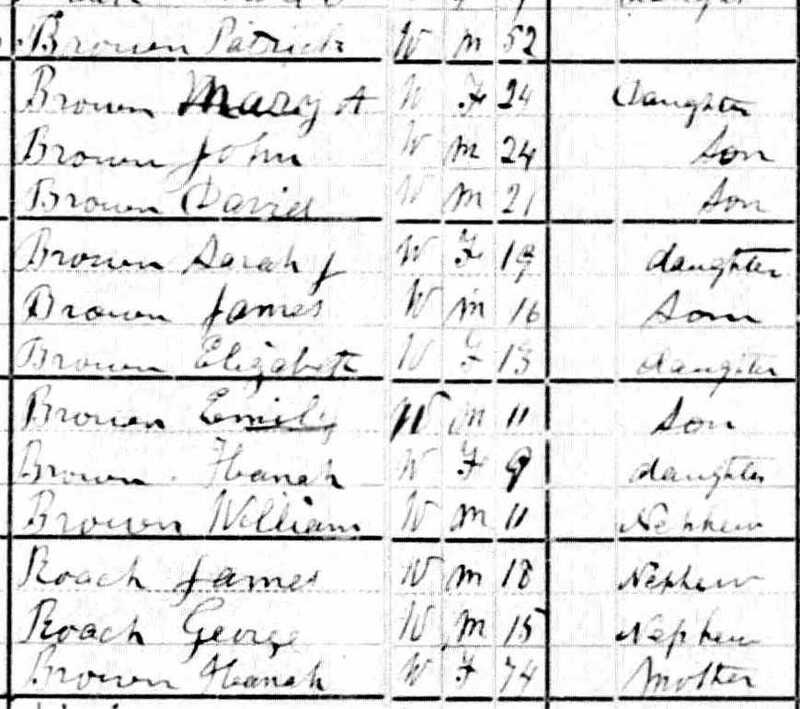 The 1870 census shows Ellen as a “Kelly” further suggesting she may, in fact, be a sister of our Hannah. 11. Map is a section of the J.H. Colton & Co. 1855 map of Chicago. The burned area is shown in pink. 12. Michael Brown moved from the time the 1872 city directory was published and 1874. The 1874 city directory shows Michael Brown at 79 Ewing, the same address shown on Ellen’s “burial permit.” Since 79 Ewing was in the burned area, perhaps they were living in one of the "shanties" provided by the Aid Society. From a combination of census records and city directories, it appears that Ellen and Michael are related, likely mother and son. 13. William Brown is the son of John Brown. John Brown is a brother of Patrick being the third child of Hannah Kelly and Timothy Brown. 15. Brown, David, op. cit., p. 4. 16. We will look at Mary Brown Gray in future posts. Common names are difficult to affirm; however, this is the correct Mary Gray. I have been able to follow her through from the 1850 US census to her death in 1886. She is listed in the 1885 Chicago City Directory as the widow of William, and in the 1886 census as the widow of Henry. Her husband is alternately listed as William, Henry, William Henry, or W.H. is various records. He was always shown as a baker or confectioner. Mary’s son, Lyman, is listed as a confectioner in the 1885 directory and candy maker in the 1886 directory. 17. Because of a fire in the 1930s at Holy Trinity Church in Bloomington, Illinois, no early information survives for St. Mary’s Cemetery. The records they have are from a 1985 survey done by members of the community that recorded the tombstones in the cemetery at that time. There is a record, and an inscribed tombstone for Anne Brown, the wife of Patrick Brown; but, no other inscription is available. Thank you Mary Ann as usual. I was interested that there was a burial permit for Johanna. How did you access it? Any other info besides her address? I found the information about Johanna on the "Indexes to deaths in the city of Chicago during the years 1871-1933: showing name, address and date of death." The indexes are on microfilm and available from the Family History Library. The Rep-Sik section of the alphabet is on film #1295973.